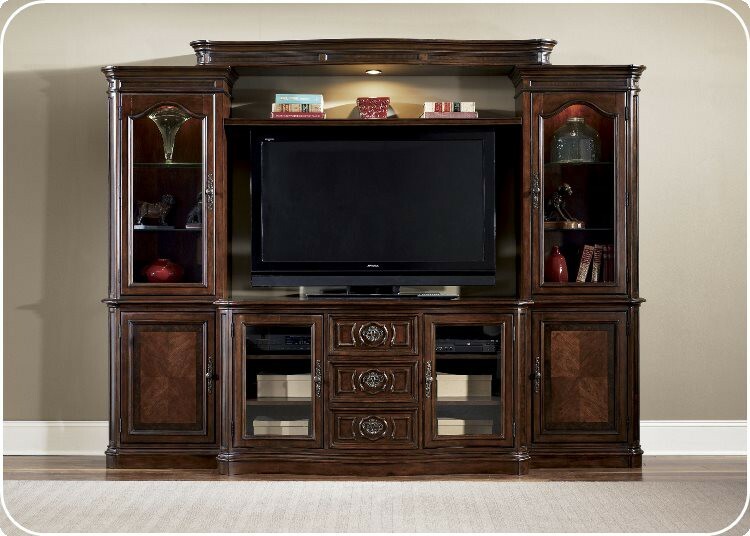 Add traditional style to your living space with Liberty&apos;s Andalusia entertainment center from Carolina Furniture. Crafted using hardwood solids and cherry & walnut burl veneers, this marvelous piece of furniture offers tons of space for proper organization of media consoles and accessories. It features three stacked drawers at the center with full extension metal glides to take advantage of the full capacity, and two side cabinets with arched-glass panels and adjustable shelves behind them for storage of media players and systems. Not to miss, heavy crown molding, cantered corner accents and a rich vintage cherry finish, make this entertainment TV stand from the Liberty Furniture Andalusia Collection and Carolina Furniture a perfect addition to every contemporary living room.